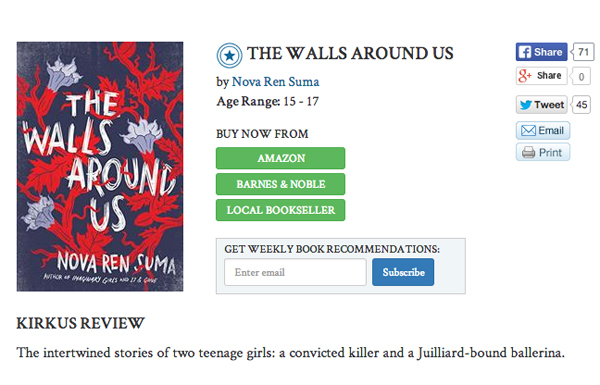 A Kirkus Star for THE WALLS AROUND US! The intertwined stories of two teenage girls: a convicted killer and a Juilliard-bound ballerina. Amber’s an inmate at Aurora Hills Secure Juvenile Detention Center, with a story to tell about the night the doors all opened at the prison. Violet’s a dancer bound for New York City and artistic success. The girls have secrets, and each takes the chance to let tidbits of truth slip into her narrative, each using her own unique and identifiable voice in alternating chapters. Amber rarely speaks only for herself, identifying almost exclusively with the other prisoners. “Some of us knew for sure,” she solemnly explains, speaking collectively. “Some of us kept track of days.” Violet, on the other hand, is deeply self-absorbed, worried over the three-years-past death of her incarcerated best friend but only for how it affects her and her chance at Juilliard. As the girls’ stories unfold, it becomes increasingly clear that Amber’s and Violet’s musings occur three years apart—yet are nonetheless intimately connected. The wholly realistic view of adolescents meeting the criminal justice system (with a heartbreaking contrast portrayed between the treatment of a wealthy girl and that of her poor multiracial friend) is touched at first with the slimmest twist of an otherworldly creepiness, escalating finally to the truly hair-raising and macabre. Eerie, painful and beautifully spine-chilling. Thank you so much, Kirkus! I’m so wildly excited to have such an incredible first review of the book!